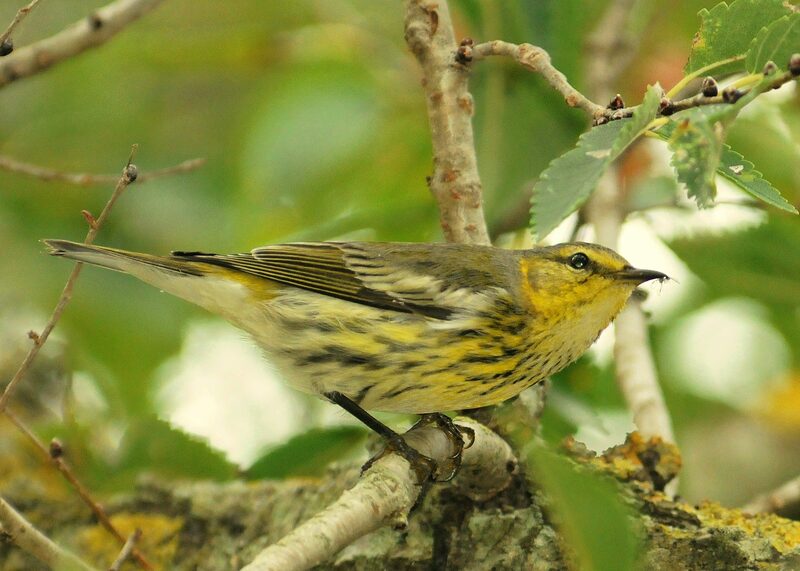 An adult male Cape May Warbler gleans tiny flies from tree bark in Cape May, NJ. Image by Derek Stoner, 9/26/10. 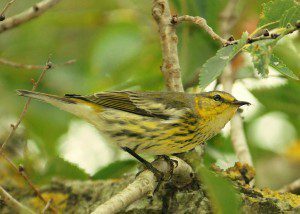 When considering the best location to observe fall migration of birds, there is one place that comes to mind for most birders: Cape May, New Jersey. An annual tradition among birders is to make a pilgimmage to Cape May, that favored place where birds always seem abundant and rarities are expected. Monarchs by the millions(literally) pass through Cape May on their way south, fueling up on nectar to provide the energy for their journey. A couple of bright male Cape May Warblers(so-named because the first-specimen was “collected” in Cape May back in the 1800’s) entertained us with their feeding antics as they gleaned gnats off of tree branches. We watched these handsome warblers from as clsoe as 6 feet, and binoculars were not necessary! One of the big stories of this fall is the massive numbers of migrating Monarch butterflies funneling through the Cape. 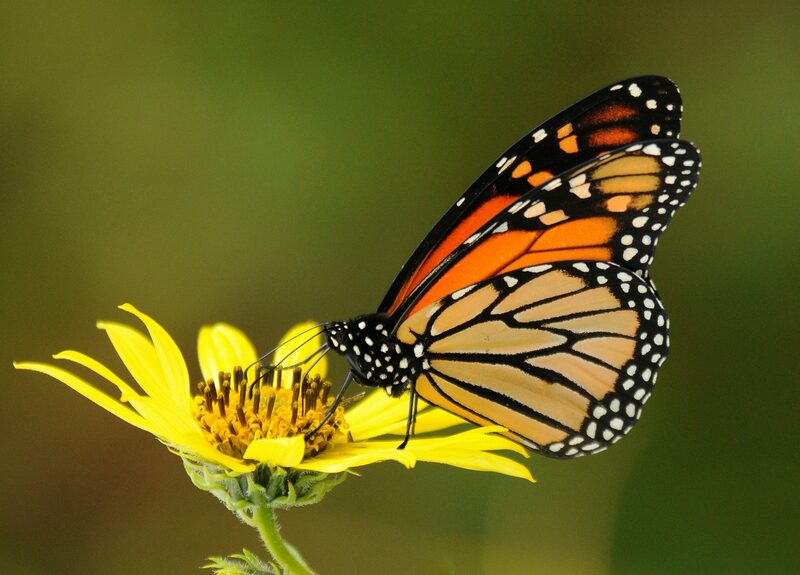 One day in mid-September, and estimated 1.4 million Monarchs roosted in Cape May overnight, departing the next morning orange and black clouds! On our visit, we merely saw thousands of Monarchs passing by in a constant stream, some pausing to sip nectar from the abundant flowers. A Dickcissel brightens up a brown patch of brambles. As expected, we did see our share of unusual birds. 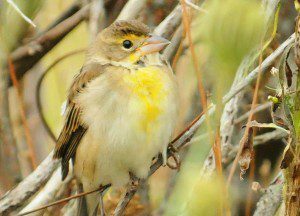 One of the best is this Dickcissel, a type of prairie-dwelling sparrow that sometimes shows up in fall on the East Coast. Curiously, they like to hang out with the ubiquitous flocks of House Sparrows. 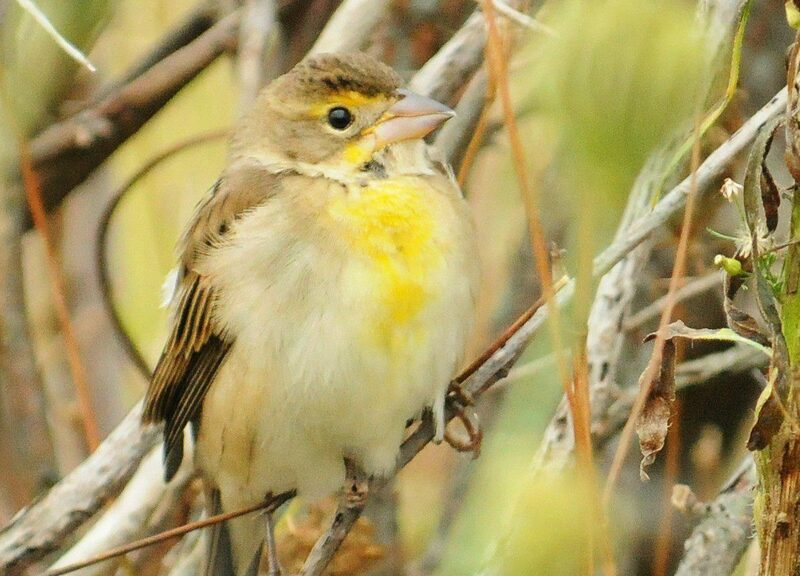 A bright yellow-chested Dickcissel sure stands out in the drab sparrow crowd! 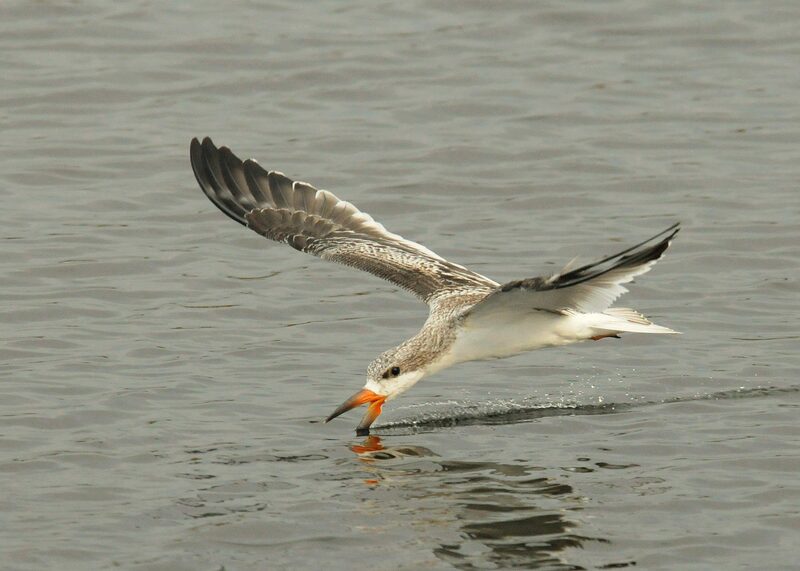 A juvenile Black Skimmer knifes its specialized beak through the water, ready to snap up a fish. One of the amazing sights of the day(besides the hundreds of migrating hawks and falcons) is the concentration of waterbirds we saw. At the famous “Meadows” bird refuge, we found 9 species of shorebirds, 5 species of ducks, and a real stunner of a bird: the Black Skimmer. These birds cruise over shallow water with the tip of the incredibly-long bill slicing through the water. When the bill encounters a fish, the bill snaps shut, trapping the prize. We watched this graceful creature swoop back and in front of us, gracefully picking minnows out of the water.